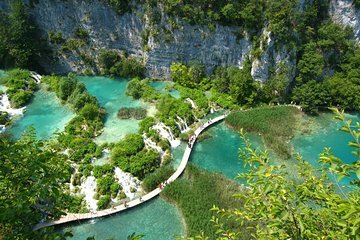 Descubra la belleza natural del Parque Nacional de los Lagos de Plitvice a su propio ritmo en un tour privado de un día completo desde Split. Siga los paseos marítimos o recorra el tren que rodea el parque, declarado Patrimonio de la Humanidad por la UNESCO, visite los 16 lagos y disfrute de las espectaculares vistas de los bosques, cascadas y acantilados de dolomita. La excelente relación calidad-precio incluye la recogida en el hotel y el transporte de ida y vuelta. We were expecting more than just a ride to and from our hotel to the park. On the plus side, our driver spoke very good English and was a great guy on top of that. On the negative side, we were picked up at our hotel, we were allowed a stop or two to get sandwiches to take into the park, etc. Once we arrived at the park however, we were dropped off at the entrance to the park and left to our own devices to purchase tickets, find our way around and pick the best routes. Basically, this trip is an air conditioned van ride and some water. Seems pretty pricey for that. I believe that the wording on this tour is misleading - our driver did exactly what he was hired to do by the company that arranged the trip. Our trip was diverted to another location given heavy rain in the Plitvice area. Our guide was flexible, however, so the other lake location was an ok substitute.